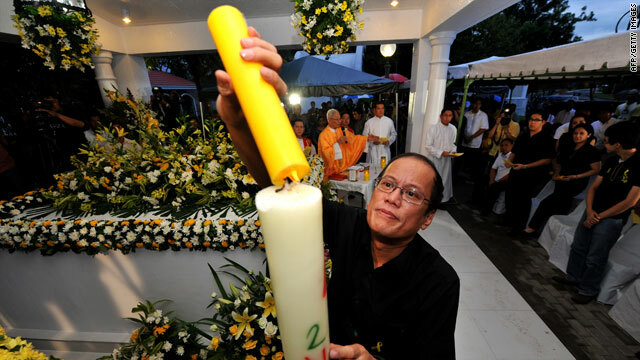 Incoming Philippines president Benigno Aquino lights a candle during a mass at his parents' tomb in Manila on Tuesday. Manila, Philippines (CNN) -- As many Filipinos noisily celebrate the inauguration of their quiet new president, the inevitable question forms on many observers' lips: What's their new leader -- Benigno Simeon Cojuangco Aquino III, better known as "Noynoy," really like? "Don't let me start out having an inflated sense of my own worth or my ego, not having my feet planted firmly on the ground because I might succumb to the same temptations that those who we are criticizing have done," Aquino said in April from his family home in Quezon City. "I'm just hoping my neighbors will not be too bothered by all the people who will wait in ambush here to corner me because it's more accessible here than in (the presidential palace) Malacañang! If we're able to effect that, and I'm still welcome while I'm president, then I really would choose to live here." Like his mother -- the former Philippines president and beloved icon of democracy, Corazon ("Cory") -- Aquino was initially reluctant to run for presidential office: He had to be coaxed into the leadership race by friends and supporters; he even sought spiritual guidance from an order of nuns before declaring his interest. Opponents argued that his record as a politician was undistinguished. But for his supporters, it was more important that he served for nearly 12 years without drama or controversy as a congressman and senator. There appear to be no question marks over his integrity, no suggestions he has used his influence inappropriately; so in a country where corruption is endemic, they say this clean record is in itself a noteworthy achievement. Aquino won his election by a landslide, persuading voters with apparent qualities that made them believe he is morally fit for the job: an honest track record and a sincerely held concern for ordinary Filipinos -- many of whom struggle to rise above third-world poverty. At 50, Aquino is still a relatively youthful president, and he will have to be strong and courageous in leading a country where political violence is common. His senator father Benigno ("Ninoy") was only 50 years old when he was assassinated in 1983 on returning to Manila to lead a democratic opposition against the dictator Ferdinand Marcos. In 1987, while his mother Corazon ("Cory") was president, rebels attacked her residence at Malacañang Palace, and Aquino narrowly escaped death. Three of his escorts were killed, and he was hit by five bullets -- one of which is still embedded in his neck. "He's been through such a lot in his life," says Mai Mislang, Aquino's communications officer. "At 12 he was forced to take on an adult role -- taking care of his sisters, his mom -- when his dad was incarcerated [by Marcos], so he had to grow up quickly." During campaigning, a small child gave Aquino a bamboo piggy bank. The boy said to him: "This is for my future -- a good one, or a better one." Another child gave him a bottle filled with peso coins and a note that said: "Dear Noynoy, I'm sending you lots of monies. I will also say lots of prayers for you, because I want you to win. When you win, please go to the kids, and make sure they have a school to go to." In an interview in April, Aquino said these heartfelt donations really touched him: "It reminds you of the responsibilities you have in this campaign." Often appearing in TV interviews as a quietly spoken, serious man, Aquino was criticized for failing to project enough presidential charisma, strength or charm. But as his campaign gathered momentum and ended with a resounding victory, Aquino's confidence seemed to grow -- so now he appears more comfortable in public, and his earnest demeanor is being more widely appreciated. Ms. Mislang says: "He may not be the type of person who likes the limelight -- in fact he just does things in the background. He's both extrovert and introvert. For the longest time he's a shy person, but then if you get to know him, he will go out with you and joke around with you -- he has a very good sense of humor. Aquino likes to relax by playing pool, or listening to music -- mainly jazz or bossa nova -- something that's "easy to the ear." For the sporting life, Aquino is something of a marksman -- he used to compete -- shooting targets with rifles and handguns. Declining questions about presidential proposals to his current partner, Aquino has not married yet. Although previously having a number of girlfriends, he's never acquired a womanizing reputation. Aquino avoids alcohol and prefers to drink Coke; but he does smoke -- about 20 cigarettes a day. In private, his style appears to be low-key. One Manila businesswoman, Sandra Alfonso, who has mixed in the same social circles as Aquino, noted: "At parties you wouldn't even know he was there. He appeared humble, with a quiet dignity. I think he's inherited the spirituality and classy composure of his mother. But he's no pushover, so if someone says something he doesn't agree with, he'll say so quite firmly." Given his family's traumatic history, will Aquino enjoy being the president? He said in April: "If it redounds to the people and they say 'Thank you -- you achieved this, you changed that' -- then I think it will be worthwhile. It's just six years, and if this is the sacrifice that's necessary, to make meaning of all of the sacrifices that came before it, then it will be worth it."